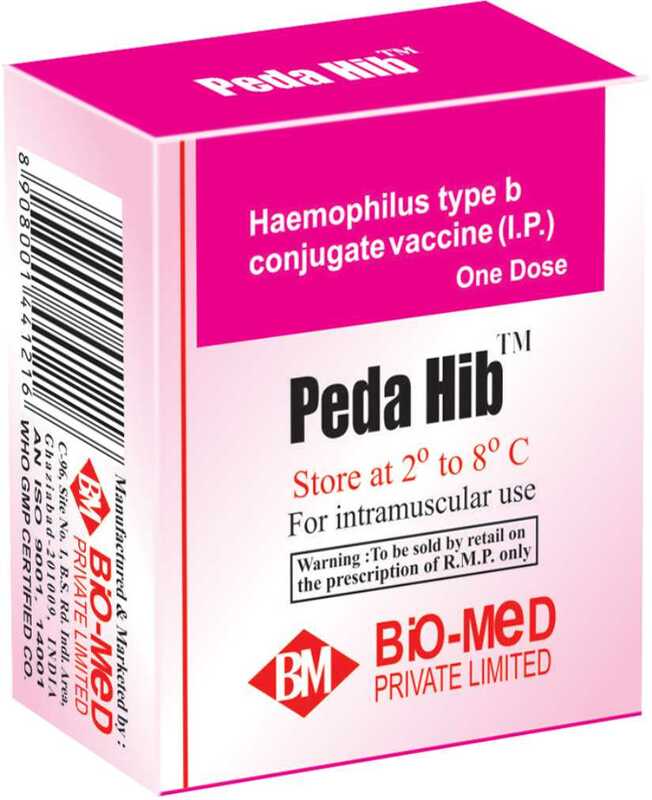 Peda Hib™ is a highly purified vaccine prepared from capsular polysaccharide (polyribitol phosphate) short named PRP, covalently bonded to tetanus toxoid protein. Addition of lactose and freeze-drying has resulted in a highly stable vaccine. This vaccine induces ‘T’- cell dependent immune response in infants that is essential for appropriate initial humoral antibody response and priming for booster effects (anamnestic response) of subsequent vaccinations. Such immune response is lacking in vaccines prepared from unconjugated PRP. Peda Hib™ has been manufactured using the latest technology to remove contaminants eg. L.P.S. pyrogens to make it the least reactogenic but highly immunogenic vaccine. Thus Peda Hib™ is the latest generation vaccine of the best quality in its class. Peda Hib™ conforms to I.P. Peda Hib™ is indicated for the prevention in children from 6 weeks to 5 years age, of invasive diseases caused by Haemophilus influenzae type b e.g. Meningitis, cellulitis, epiglottitis. In no case can the tetanus protein contained in Peda Hib™ replace the routine tetanus vaccination. One dose in glass vial with appropriate diluent. Reconstitute the lyophilisate with the entire content of the diluent provided. Shake gently for full reconstitution. Administer 0.5 ml by intramuscular injection. (A) Before 6 moths : Peda Hib™ can be administered to infants from the age 1.5 month with three injection of one dose(0.5ml) at intervals of one or two months followed by a booster (4th injection) at 15-18 months. Hypersensitivity to any of the component of the vaccine. Acute infection or febrile illness. As in the case of any active product, there may be more or less moderate and temporary side effects. Mild local pain, redness, induration or fever may occur during the 48 hrs following injection. D.P.T. vaccine causes more or less moderate temporary side effects, similar side effects may be observed when Peda Hib™ is administered after reconstituting with D.P.T. vaccine. The vaccine must be stored at 2° C -8°C . Shelf life of Peda Hib™ is 3 years from the date of manufacture.